Part I of Superhero Healthcare identified several bright spots within American healthcare where liberated caregivers deliver appropriate, efficient care to engaged patients; where the interests of health companies and their customers align; and where compassion, empathy and shared decision-making govern medical treatment. Superhero healthcare is getting traction, big time. Unfortunately, its nemesis, wasteful Gotham healthcare, still dominates the land, fueled by Fee-For-Service (FFS) payment and an insatiable hunger for resources. FFS payment is superhero healthcare’s kryptonite. It fragments care delivery and creates perverse economic incentives while heaping administrative burdens on providers. It thwarts caregiver-patient relationships and impedes care quality. It reduces family incomes, diminishes communities and lowers economic productivity. FFS payment is the principal impediment to systematic healthcare reform. Superhero healthcare’s secret weapon (and healthcare’s most disruptive innovation) is full-risk contracting. Health companies increasingly offer coverage and treatments with full upside and downside financial risk. Full-risk contracting promotes effective and efficient healthcare delivery. It is transforming the healthcare industry. The challenge is in scaling full-risk contracting and superhero healthcare to the point where they dominate the land. Superhero healthcare cannot emerge fully until FFS payment dies, and FFS payment will not die until healthcare’s buyers (employers, governments, individuals) employ full-risk contracting to purchase healthcare services. Every day, more individuals are enrolling in full-risk health insurance plans and more healthcare buyers are demanding bundled payments for episodic treatments. As full-risk contracting displaces FFS payment, it vanquishes Gotham healthcare. More importantly, full-risk contracting creates evermore “bright spots” as companies deliver superhero outcomes, lower costs and provide personalized service. Full-risk contracting is at or near critical mass. It is advancing beyond early adopters into the general population. Superhero healthcare is on the way. FFS payment is healthcare’s old math. Revenues are flexible. Managing expenses is relatively less important. “Getting paid” is the principal managerial goal. Overtreating patients and manipulating billing codes are proven strategies for optimizing reimbursement. Gotham healthcare wins. The American people lose. Under full-risk contracts, revenues are inelastic (generally fixed) and managing expenses is exceptionally important. Managers must focus on value creation and customer service to generate profits. This is healthcare’s new math, and health companies must learn it to remain viable in the post-reform marketplace. The Affordable Care Act (ACA) created the Center for Medicare and Medicaid Innovation (CMMI) to experiment with “value-based” payment reforms. CMMI implemented an array of shared-savings and partial risk-sharing programs that have failed to achieve meaningful cost savings. These poor results are not surprising. CMMI’s value-based programs retain the basic FFS payment features that fuel Gotham healthcare. More of the same is not a recipe for system transformation. FFS payment is deeply imbedded within the American system. 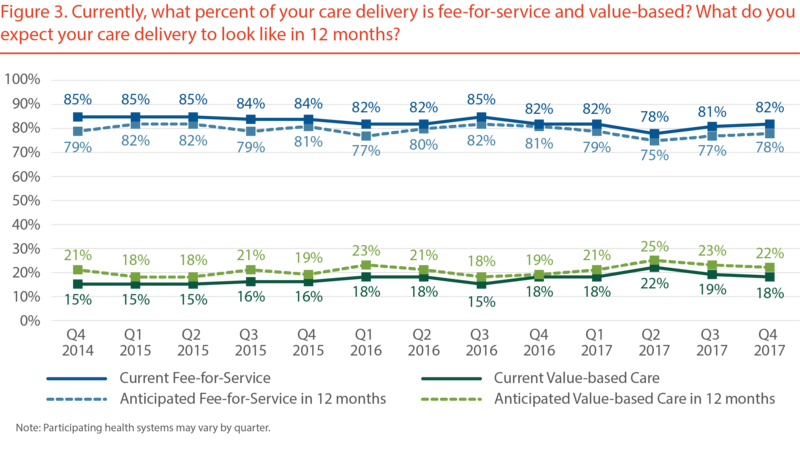 Incremental approaches to payment and delivery transformation wither. Real transformation requires radical payment reform. Pre-determined “bundled” payments for episodic care. These generally carry 90-day performance guarantees. Fixed monthly payments to cover the health risk for distinct populations. These programs, such as Medicare Advantage (MA), adjust the monthly for each individual’s predicted health risk. With revenues largely fixed, health companies participating in full-risk contracting must deliver necessary care within budgetary constraints or lose money. Since many full-risk programs incorporate customer choice, successful health companies also must deliver a great consumer experience to achieve long-term sustainability. This is superhero healthcare in action. In healthcare’s most overused metaphor, health companies straddle between a “volume” dock and a “value” boat as the boat drifts into the lake. Health company leaders use this metaphor to implicitly acknowledge their acceptance of sub-optimal performance in exchange for FFS payment. FFS payment is transactional and rewards activity, not outcomes. Full-risk contracting is exactly the opposite. It pays for outcomes and rewards providers that deliver them efficiently. It is almost impossible for providers to practice activity-based FFS medicine and outcomes-based full-risk contracting simultaneously. This explains why most providers do not participate in full-risk contracting or suffer significant losses when they do. Until now, avoiding full-risk contracting has benefited large health systems financially. Every quarter, the Health Management Academy and H2C survey C-suite executives at large health systems to assess current and anticipated levels of value-based contracting. The following chart depicts a persistent and disappointing status quo. Every quarter executives say they expect value-based contracting to grow, but it continues to fluctuate between 15-22%. Source: The Academy H2C Strategic Survey – Q4 2017. “Cost & The Evolving Payment Model.” March, 2018. Since 2014, FFS payment has accounted for over 80% of large health systems’ care delivery. The remainder includes largely ineffective shared-savings arrangements as well as full-risk contracts. The stark conclusion is that value-based care, broadly defined, has not gained sufficient critical mass to change practice patterns. Despite appearances to the contrary, however, full-risk contracting continues its unrelenting growth through Medicare Advantage (MA) plans, Accountable Care Organizations (ACOs) and direct-contracting vehicles. As full-risk contracting gains traction, it is forcing payers and providers to learn and practice healthcare’s new math. Disruptive innovation takes time to scale and advance into the marketplace. In his seminal book Crossing the Chasm (first published in 1991)  Geoffrey Moore describes the sequencing of the following five customer groups adopting disruptive innovation as it moves into the marketplace. Moore identifies an adoption ptation “chasm” between “visionaries” (innovators and early adopters) and “pragmatists” (early maority). These chasms emerge because visionaries and pragmatists have different purchasing motivations. Visionaries want to lead innovative change and willingly take more risk. By contrast, pragmatists don’t become buyers until they believe a disruptive innovation is taking hold. That occurs when the disruptive innovation captures 15%-20% market share. Only then will pragmatists move to incorporate the disruptive innovation into their business models. The technology firm Gartner developed the “hype cycle” to describe the emotional roller coaster that accompanies disruptive technologies as they move through the different buyer groups. The hype cycle rises quickly to “the peak of expectation” before falling dramatically into the “trough of disillusionment” as the innovation seeks to cross the adoption chasm. As market share approaches and surpasses 20%, the disruptive innovation enters “the slope of enlightenment” where pragmatists become active buyers. It settles into “the plateau of productivity” as the innovation earns widespread adoption. Many, perhaps most, disruptive innovations do not develop enough momentum to “cross” the adoption chasm. They die in the “trough of disillusionment.” This will not happen to full-risk contracting. Stuck in the “early adopter” stage for the last decade, full-risk contracting is making the leap into the “early majority” as its market share crosses the 20% threshold. With these gains, full-risk contracting will outperform incumbent health companies clinging to FFS business models. More importantly, it will empower and reward companies that practice superhero healthcare. They will gain market share by liberating caregivers and customers to pursue better health and healthcare services together. MA is a principal force driving the expansion of full-risk contracting. Initially, few payers offered private plans for Medicare-funded coverage. In 2003, Congress enacted legislation that enhanced MA’s payer subsidies which incentivized more payers to offer MA plans to consumers. The program has grown steadily since. Today, roughly a third of Medicare enrollees participate in MA plans. MA is poised for rapid growth as the number of Medicare-eligible baby boomers increases drastically in 2019. Bundled payment, direct contracting and ACO programs are also expanding. Collectively, full-risk contracts are “crossing the innovation chasm” in many markets as they surpass the 20% market-share threshold. The realization that full-risk contracts will define the post-reform marketplace has triggered significant repositioning by “pragmatists.” The CVS-Aetna merger, the Advocate-Aurora merger and the new Amazon, Berkshire Hathaway, JP Morgan health company reflect this emerging market dynamic. Superhero health companies aren’t waiting for enlightened regulation to attack system inefficiencies. They’re creating value and going directly to healthcare buyers. They’re offering better healthcare products, competitive prices and superior customer services. They have the forces of truth, beauty and justice on their side. The best health companies distribute responsibility to front-line caregivers. They support them with powerful workflow tools to guide real-time medical decision making. This frees caregivers to engage patients, appreciate their hopes and fears, answer their questions and become trusted “care-navigation” guides. Value follows payment reform in healthcare. Healthcare buyers are flocking to full-risk contracts. Why not? They create real value. Demand-driven change generates superhero results. Health companies must adapt or risk losing market relevance. Goodbye Gotham. Hello Superhero Healthcare.